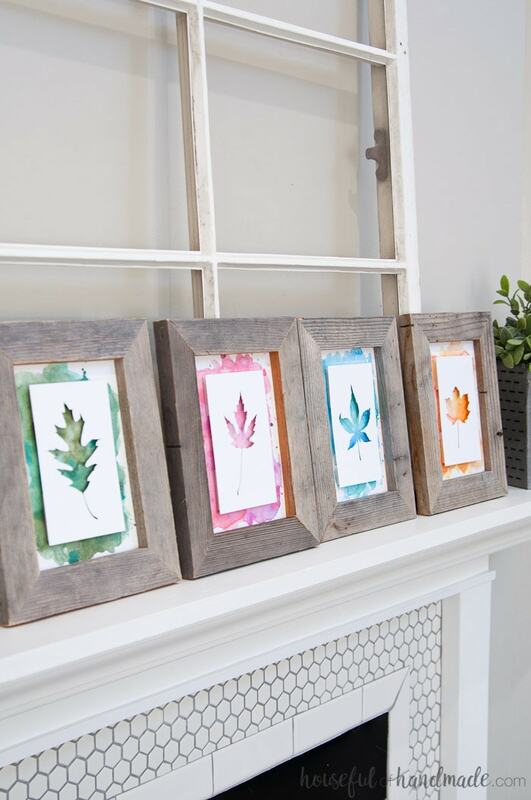 Create beautiful rustic fall decor with this easy DIY. 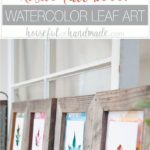 Reclaimed wood picture frames highlight watercolor leaf art for easy rustic fall decor you can be ready to decorate with in minutes. It’s time to pull out the rustic fall decor and fill your home with all things warm and cozy! Creating the perfect rustic fall mantel doesn’t have to be hard or expensive. 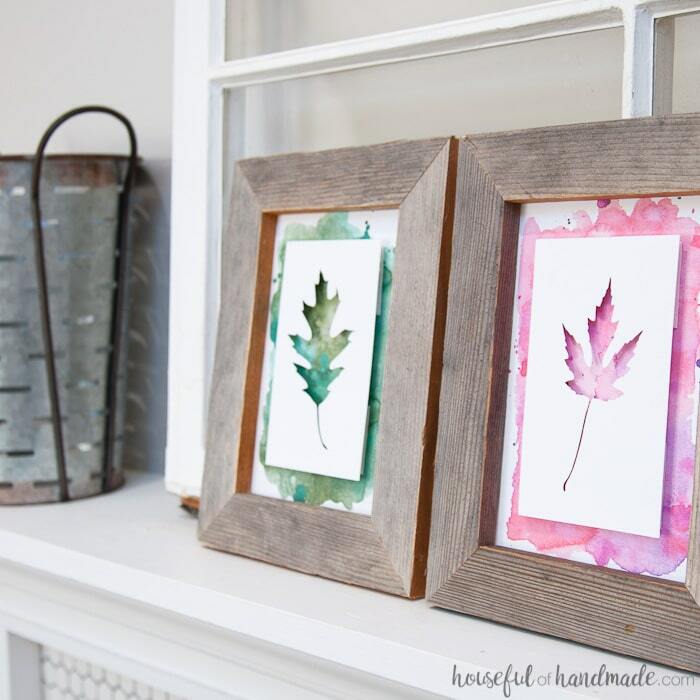 These printable watercolor backgrounds are decorated for fall with autumn leaves. 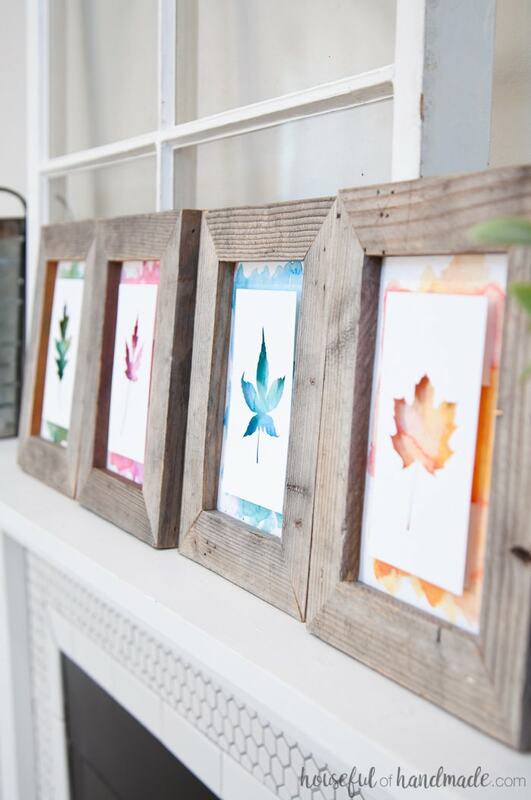 They are perfect for non-traditional fall home decor. Every year I get so excited to decorate my house for fall. I pull out all the pumpkin and apple scented candles. Open the windows to let the crisp air into the house. And then turn to all things rustic for our fall decorations. 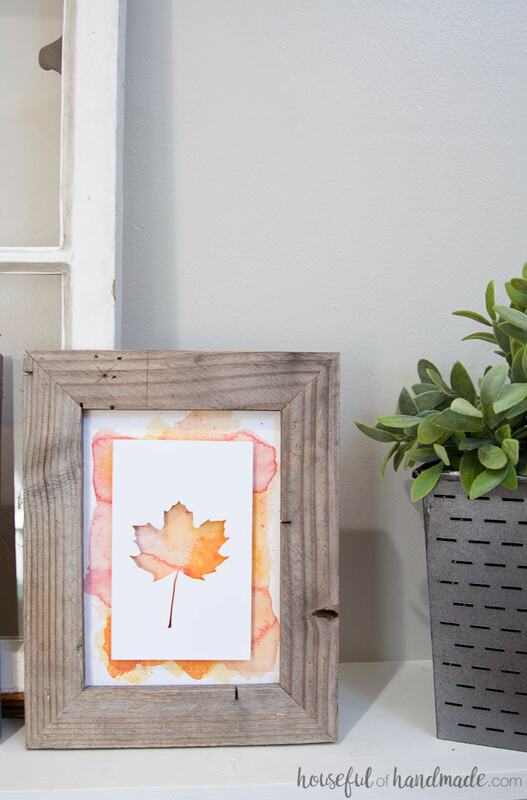 There is just something about fall that makes reclaimed wood and chippy paint fit perfectly in with the decor. But this year I wanted to do something non-traditional for our rustic fall decor. Now don’t get me wrong, I love pumpkins and orange and everything fall. I really do, but sometimes I just want to try something different. A couple years ago, I went for a Farmer’s Market themed fall decor. The rustic Farmer’s Market pallet sign was perfect with the printable fall apple sign. And I loved that it wasn’t all pumpkins. So this year I decided to try another non-traditional fall theme. And what say’s fall better than falling leaves?! Even though the leaves are not turning colors at our house just yet, I know soon the mountains will be a wash of colors. So I decided to make our rustic fall decor a wash of colors too. No more just orange and tan, I used watercolors with reds, greens, blues, purples and yellows too! 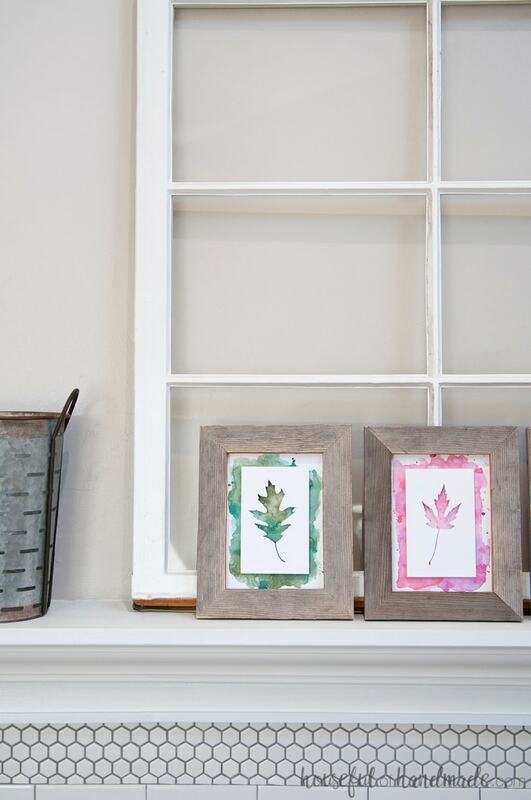 The watercolor leaves are the perfect art for our rustic fall mantel and I cannot wait to incorporate fall leaves into the rest of our rustic fall decor. I know a rustic fall leaves wreath is definitely in order. And we’ll also need to add fall leaves to the dining room centerpiece. Can you tell I am so ready for all things fall? 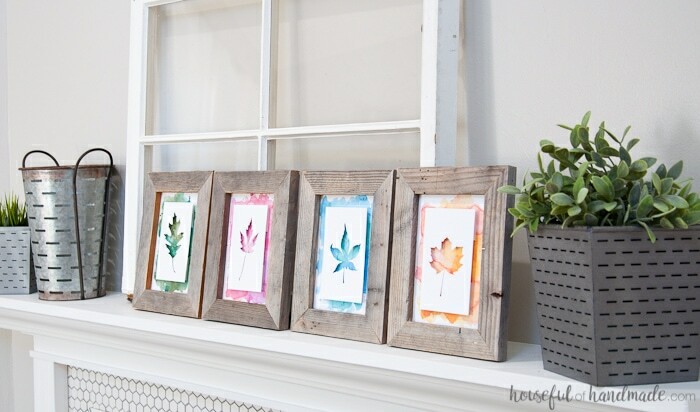 To create this easy rustic fall decor, I used reclaimed wood to make some 20 minute rustic picture frames. The wood was a gift from a friend who was replacing their old garden fence and has a beautiful patina to it. 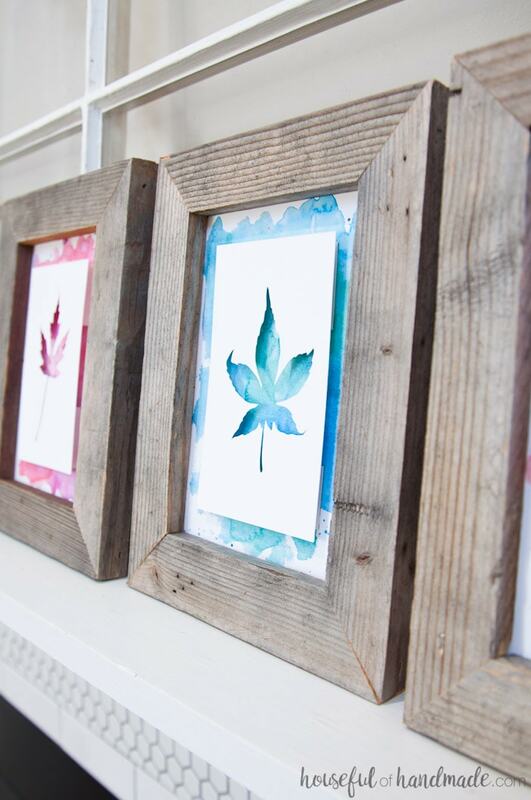 And you can build picture frames quickly with just a couple tools. 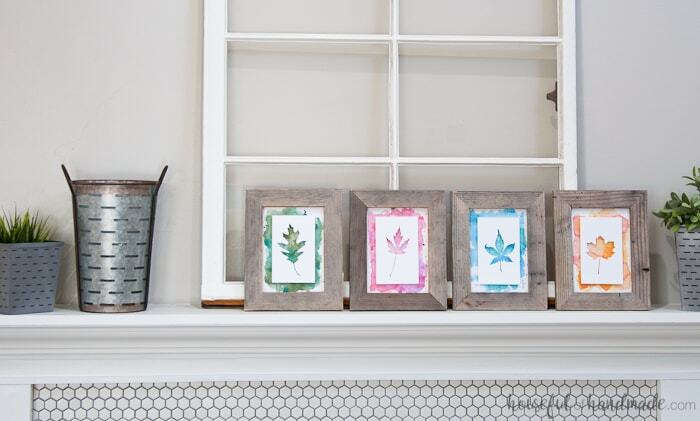 Then I float mounted leaf silhouettes over these watercolor backgrounds with my favorite cheater float mount method. I love the bold colors of the watercolor backgrounds. They are less traditional than orange and red, but still make the leaves look perfect for fall decorating. If you are ready to make your own rustic fall decor, click the arrow below for the complete tutorial. Wonderful idea! I was looking for some fall decoration ideas that do not include pumpkins and this is adorable. Thanks Brooke! As much as I love pumpkins, non pumpkin decor is so fun too. merci beaucoup, c’est très joli -very nice ! I bet autumn in France is wonderful! Enjoy.